Peruvian motion designer D. Israel Peralta shares how a viral design project ignited his animation career. For a lot of folks the journey to become a motion designer doesn't start with After Effects. D. Israel Peralta is no exception. Through a crazy series of events Israel's career has developed, all it took was hard work, education, and a little bit of luck. He was kind enough to share his story and give a few tips for motion designers looking to grow their networks. You're in for a great read. I live in Lima, Perú and currently work remotely from home for Fractl, a digital marketing agency based in Florida. It was a long journey for me but I’ll try to make it short. As a kid I was not really into art stuff. I really only remember loving dinosaurs, and still do. I tried Biology and Hotel Management before making friends that studied Graphic Design, it was then when I saw they were so passionate about their career that it caught my attention. While I was making boring business plans for my Hotel Management career, they were excited about painting a chromatic circle and working on drawings for their homework. It was then when I met my friend, Daniel Wong, who drew manga style. I had never saw such skill in person, so I decided to try myself and see how far I could go. I came to realize that I enjoyed creating visual messages more that anything else so I decided that next term I would change career and start studying Graphic Design at San Ignacio de Loyola University (USIL). I was 20 years old and really excited to start! As I said, I’ve never been into art, I loved drawing manga now, but using stuff like oil paint, charcoal, and other physical based art was a struggle for me. But, after a couple of terms we started learning Adobe Illustrator, and I loved it. That was my thing, understanding how a tools work, learning shortcuts, finding ways to save time and be more productive. Illustrator gave me the freedom and confidence to create whatever I could think of. Around my 3rd year I was enrolled in a branding course. I felt like I was doing good in classes, but when I had to present my work to a jury my logo got rejected. They didn't think the font was the right one for my concept. Was I lacking the taste or luck to find the right font? I decided I need to do some research, so I went to the university’s library and start reading books about logos, then I started reading about typography, design history, Bauhaus, Swiss Modernism, etc. Suddenly is all started to connect and I started to have new revelations about design. Being informed about past design trends, and why and how each style was shaped, helped me understand today’s eclectic design and how to analyze it correctly. Afterward I enjoyed classes so much more, every homework was a chance to add something to my portfolio and I would encourage students to do the same, and of course, share it. 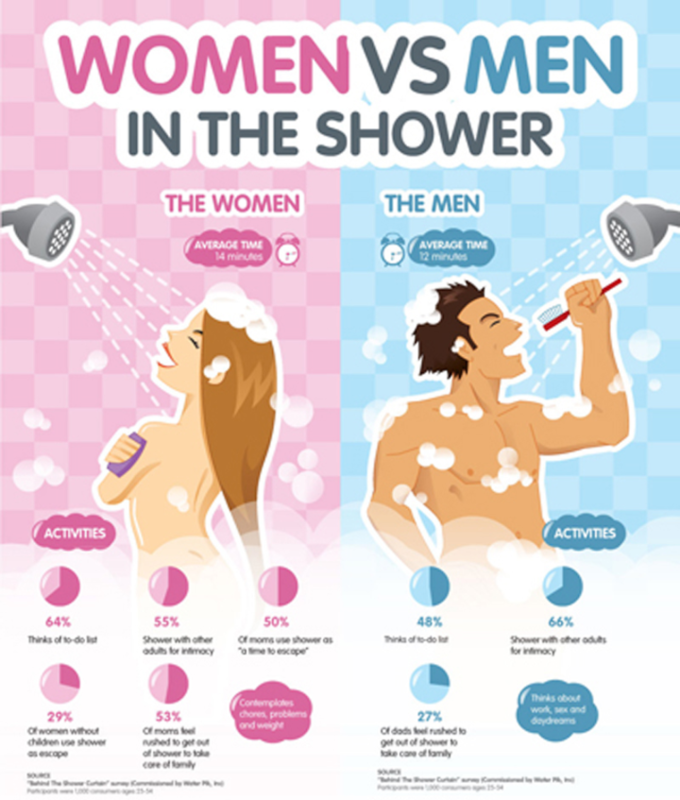 During my last year of college I took a course about infographics. 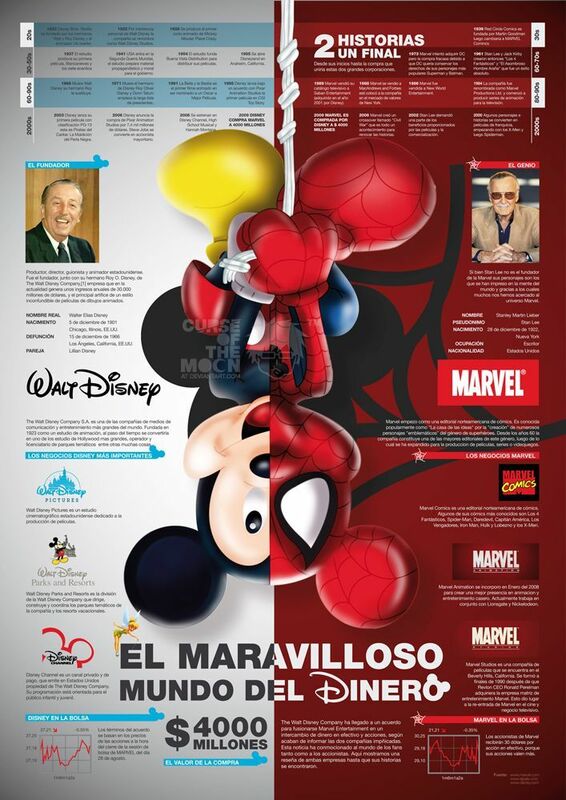 My chosen topic was the acquisition of Marvel by Disney. After designing it I uploaded it to my DevianArt account. After a few months I realized it had gone viral. This was during the time when infographics became really popular on the internet, and I was so lucky to be in the middle of it. I started getting gigs from Belgium, Canada and United States. After a few years working on web infographics I got asked if I could animate them. Animation was foreign to me, so I looked for somebody who could help. I couldn’t find anyone, so in the meantime I decided to explore by myself and freaking loved it. I was animating my own design, it blew my mind! After a few months of watching tutorials and making some experimental projects I made my first explainer video for Fractl (see below). I’ve now been working with these guys since 2010. We have been through a lot and they have been so supportive with me trying to focus on my motion design career, giving me time and opportunities to improve. I can’t thank them enough. This video I made for them, and even got the After Effects badge on Behance, I’m very proud of that! Besides working on design and motion projects I manage the design team based in Perú. I've known most of them since college, including my wife, and I’m really happy for the chance to work with them everyday. What's the motion design scene like in Peru? 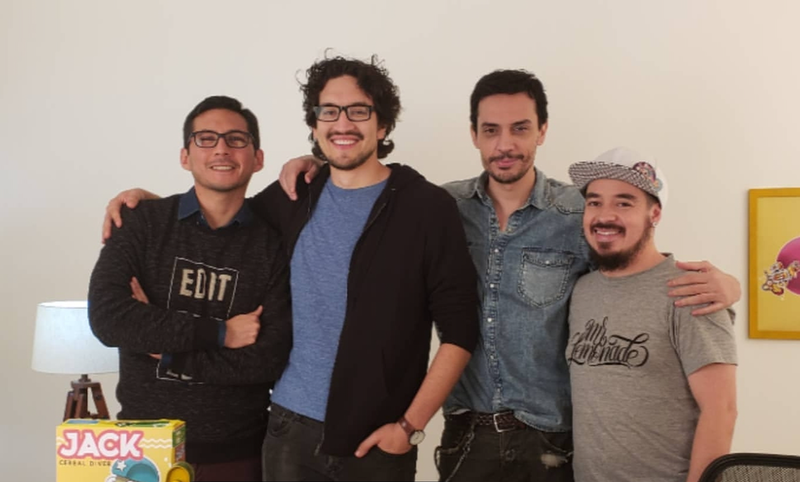 The motion design scene is growing fast in Peru. Lots of graphic designers are looking into motion design as a way to expand their skillset. Agencies and clients are looking for artists who can do animations for social media. Animation studios are few, but they are now producing for advertisement, TV and film as well. Overall we are at a stage where more education is needed. Both for the ones looking to work in motion graphics and for the clients who don’t know what work is involved when creating animation. A few years ago we started having the Latin American Design Festival here in Lima, it created some awesome momentum for the creative community. Ryan Honey a co-founder of Buck joined for this years event. That was amazing and it will for sure bring more spotlight on the motion community! We also have www.crehana.com, a Peruvian online education platform for Latin America that focus on creative careers. I’ve been working with them too for a few years now. I’ve been able to reach thousands of students interested in motion graphics. Crehana is making a positive impact by creating a community where newcomers can interact with their peers and experts in the field. I was able to meet Jorge Canedo (AKA Jr Canest) thanks to them! Your Instagram channel shows just how fast you've grown your skills. How are you able to grow your animation and design skills so quickly? Thank you! I’m always checking tutorials and courses online and the trying to find creative ways to apply them. But there are so many resources now that it can be overwhelming. Because of this, I decided to take a few months every year to focus on learning and afterwards I’ll take what I have learned and merge it into my own process to make something I’m comfortable with. Then I apply it to my work and personal projects for the rest of the year and see where it takes me. I also love teaching! You learn so much by helping others. It makes me organize my own process and forces me to look for easier ways to explain things. In fact, when I finished my Graphic Design career I was asked to stay as teacher and got to teach a course about After Effects and motion graphics. After a year teaching After Effects at the university I left the job. But, I decided to open a Youtube channel with tutorials. I feel this is a way to give back to the online community that helped when I started. Especially to the Latin Americans looking to start a career as a motion designer. Do you find Instagram to be an effective tool for marketing yourself as an artist? How does it play into your vision for your career? Yes, showing your work always helps. On Instagram you get to be part of the community, make friends, reach potential clients, and collaborate with other artists. Though sometimes you receive funny offers, and you have to know when to just pass. In my case I have been contacted by producers and motion design agencies because they found my work on Instagram. I think the goal here is to share really good work that can be shared by motion design curated galleries. That can lead to a lot of exposure, and it pays off. Also check what has been trending. Movies, Netflix shows, etc... Use it to create stuff with your own unique style. You have a lot of personal projects online, how do you get these ideas, and where do you get the motivation to follow them through? I’m always been inspired by movies, tv shows, music, and my own personal experiences. They help me to keep my skills sharp. After learning something new I usually try to put it into practice with a small project, like the girl dancing “The Floss.” I was testing character swing rigging with Duik combined with Joystick ‘n Sliders. Later I posted it with the motion paths so people can see a little of the behind the keyframes and it got featured in a bunch of Instagram galleries, I was really happy. There are a lot of challenges on IG that can keep you inspired too, Animation SmashDown by Markus Magnusson is trending, definitely check out that one. Many times I find myself trying to explain some techniques for my tutorials, and I force myself to create something fun that people can relate to and enjoy doing. Your personal project breakdowns are solid! Any tips for people wanting to do more case studies for their portfolios? Thank you! I know I don’t look for perfection on my personal projects, but I try to stick with the process, don’t skip the planning, rough animations, etc. It sure can get to a point were you just want to finish it and move on, but if you followed the right steps it will be just fine. 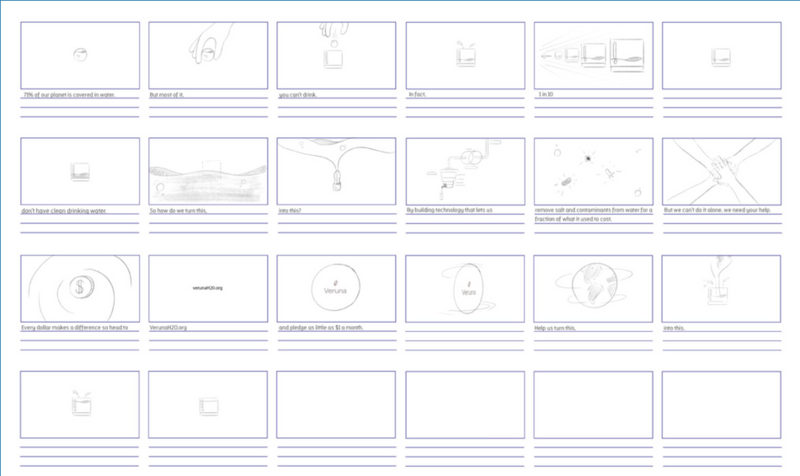 And you will have all the documentation to create a nice breakdown to share and learn from it for your next project. I also create a doc for each project to use as a log to take notes of the parts I struggled the most. I then write down how I solved them or the new stuff I learned during the process. The Cryogenics - Mr. Freeze is my most beloved personal project by far. I made it when I started studying motion graphics more seriously. There is also a breakdown video I recorded for people to learn from. We loved seeing your animated final projects from our course. The Veruna project you finished really caught our attention! You mixed cel-animation and motion graphics together for a really well executed animation. What were some cool takeaways from Explainer Camp? From the first moment I saw School of Motion was preparing the Explainer Camp I knew I had to take it. Since I didn’t have the chance to learn at a motion design studio with coworkers that can give you feedback and teach you, this course was an eye opening experience in many areas. From learning how to create a quote that clearly tells the client why our work is worth every penny, to the execution of the production process to finish the final video. In the course Jake encourages the students to create breakdowns so I did mine and posted on Behance. I knew I would have creative freedom for my final video so I decided to try mixing frame by frame animation with Ae. I had taken Henrique Barone traditional animation class on Mograph Mentor and I wanted to put it to good use. It took quite some time, but I finished the final project and was very happy with the end result. I even got contacted by an organization that helps brings environmental awareness and a studio that make videos for non-profit organizations. What encouragement would you give for those looking to take Explainer Camp? I would say "don’t doubt and take it!" What I love about School of Motion courses, is that they are not only about making a final video. You get immersed in the industry and the community with all the guest speakers in the podcasts. Plus, the knowledge Joey and Jake shares is gold. The puns are good as well. As I said before, follow each step of the process and you will get to the end with a strong piece, don’t worry if takes you some more time than you expected, just push until the end. Remember, it’s a chance to try new things and make your portfolio look even better. I’m really happy with my current situation. I get to work from home with my friends everyday, and have time to work as a freelancer when a cool project knocks to my door. I’m always open for opportunities to grow. Something I would really love to do in the near future is put more effort into Youtube and the tutorials I make. Getting on Patreon is my plan, so I can take it more seriously. I want artists to be able to learn from the internet as I did. I feel very lucky for the opportunities I had so far. If what I share helps anyone to reach their goals, I’m glad to help. Do you have any inspiration sources you think artists should check out? There are so many artists creating amazing stuff, it's hard to choose. Patswerk has an amazing illustrative style and Rudo Company has golden music video breakdowns! I look up to the work of these guys; their work really inspires me. One tip I can give you when looking for inspiration is that artist usually share small portions of their projects on Instagram, or the whole video on Vimeo, but when you go to their Behance you have a good chance of finding a beautiful breakdown to learn from. Twentieth-Century Type, by Lewis Blackwell. It’s the history of graphic design told through typography, it’s the first book about graphic design I ever read. 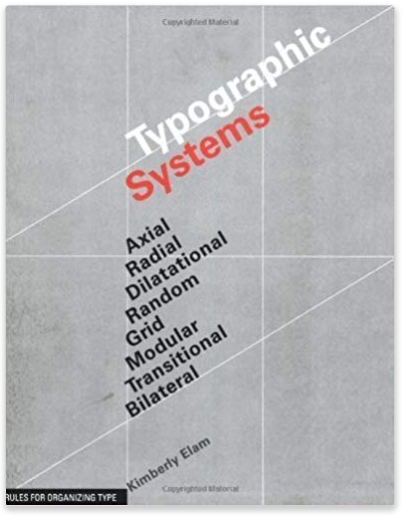 Typographic Systems: Rules for Organizing Type, by Kimberly Elam. This book is just great, if you think that you need to improve your composition and layout, this will give you the tools to be confident about it. The Alumni group is awesome. I’ve been saved more than once when struggling with some technical issues. It's amazing to be a part of a community where I can find support for technical issues, get good feedback, or share something cool. Also, seeing what other motion designers are working on is always inspiring. Every School of Motion course is so much more than you would expect. They are a whole experience. They are amazing, fun, and full of knowledge; it will blow your mind. The courses ask for a lot of time, so be prepared to make them a priority. And, even if you have some animation or design experience, be humble. Value each lesson and learn as much as you can. Make your process out of it. Don’t give up and get to the end of it, you will be proud of where it takes you. Are there any tools that you've found to be helpful for you career? Yes, there’s a script that has saved me so much time since I discovered it. Elastic Comp Changer helps you change the timing of your keyframes. You just need to set how many frames you want to add or remove between keyframes and the script moves keyframes, in and out points of the layers, and even adjusts the pre-comps. Imagine all the time you can save when working on a character animation. It’s magic! I love fighting games. I’m a big big fan since Killer Instinct for the SNES. I remember when my obsession started to take over. At 13 years old I would take the game manual to school to help understand the mechanics, and I memorized all the combos. If you play Street Fighter V on Steam you can find me as di20xx, I don’t say no to a challenge. I also started playing piano a few years ago. I’m not that good, but now I can play a few songs I always loved. I'm also starting understand a little more about rhythm. You can find me on Instagram as @d.israel.tv , I love to share WIPs in my Instagram stories there. And you can find me on Behance as disraelp. Behance is where I post breakdowns of my projects.